Labor News, Labor Media. 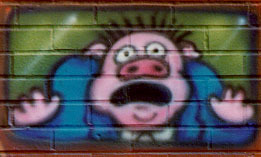 www.LaborBeat.ORG. Labor Beat Home Page. NOTE: This page is a 2012 edition. 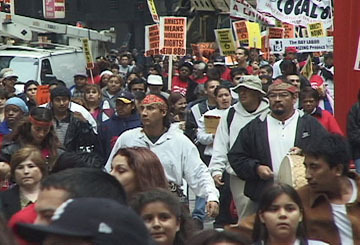 The current Labor Beat site is at www.laborbeat.org. Labor Beat on Facebook. Labor Express on Facebook. 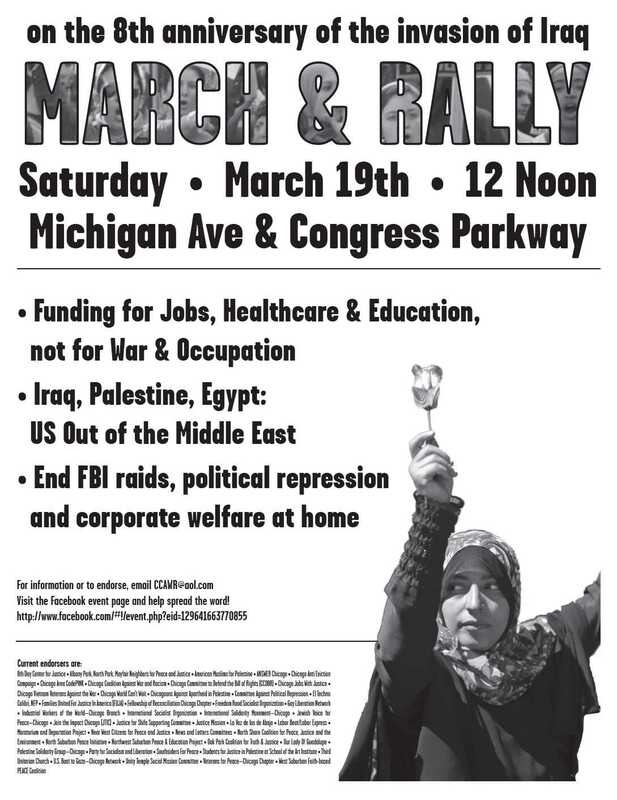 March 19, 2011 Chicago rally. 8th anniversary of the U.S. invasion of Iraq. April, 2010. MS Word Doc, Web page HTML, PDF. Help keep Labor Beat going! 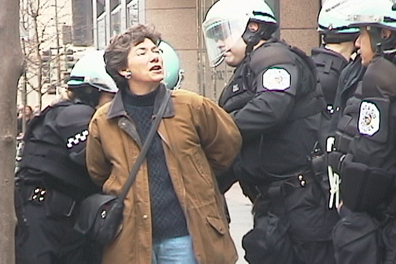 Donate $50 or more and add 4 essential labor DVDs to your library: 'Workers Republic', 'Raid on A Nation', 'Corporate Media and the Plunder of Chicago Public Education', and 'Battle Front Wisconsin'. See the full-size ad [here] for more details and a PayPal link. And please print the flyer [here] (black-and-white) to help promote this offer. Our productions document many issues of importance to workers -- issues usually ignored or distorted by the corporate media, including 'public' broadcasting. Labor Beat advocates the development of new media with a rank-and-file workers' viewpoint. The 'Newest Shows' list also includes selected older shows. Many shows and video newsclips are for sale on disks; see Videos Available below. Show lists are also on the free Labor Beat Data Disk . New shows often are first announced in news releases. 'Videos' are those Labor Beat productions that we can offer on disk or tape to workers' organizations, schools, libraries, and individuals. These are the shows that are for sale by us. The newest releases are listed first. You can order DVD disks and VHS tapes of the videos by their titles and a check for 25 dollars each (15 dollars to individuals and workers' organizations) mailed to Labor Beat. Remember that the 'spin' and even the 'facts' must always be challenged in the corporate media's coverage of Labor's issues! CLICK ON ANY HEADLINE for a full news article! U.S. and worldwide. Hourly updates from labourstart.org. Progress Illinois news service stories with the word 'labor'. today! WIN News headlines daily! Audio, 3 mins. From Workers Independent News at LaborRadio.ORG. LabourStart. International labor news, by country. Includes U.S.items. Revised hourly. News videos: . Chicago Union News .com. Labor stories in TODAY's Chicago newspapers. Includes 'Quick Hits' stories at Progress Illinois news, some exclusive stories, and links to local locals. LaborNet (USA), with some 'alerts' for you to take action. Revised every few days. Democracy Now! daily tv and radio show. Today's show and archived shows on demand. 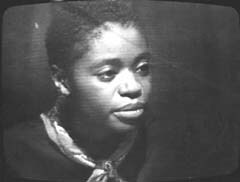 Chicago Independent Television. A monthly video magazine. Chicago actions. Archives. Chicago Jobs with Justice. Some Chicago action events. Brain Labor Report. Daily labor radio news interviews and music. Streamed live, 7:00 a.m from Ashland, Oregon. On-demand archives. Yahoo editors Labor and Union News daily headlines. Also a form to search all news, e.g., for union. KCLabor. Selected news items and news sources. UAW Crisis, www.9898.us/uawcrisis. Rank and file talk about Labor's battles with the auto companies. Past edition, 2006. UPPNet. Union Producers and Programmers Network. Links to independent shows on U.S. working people's issues. Error. Closed or moved? : Strike Page. 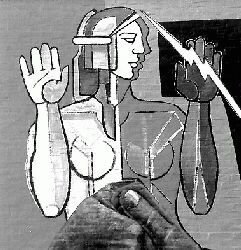 News about, and contacts for, many current strikes and lockouts. Periodicals web site links, labor library listings at Holt Labor Library. AFL-CIO-produced weekly news about U.S. unions. With searchable archives. Independent Media Center (the global site), and links to 50 more IMCs worldwide including the IMC Chicago site, which Labor Beat helped to establish. View/post news -- text, photos, audio, video -- without depending on the corporate media. Searchable! (For example, you can find postings by or about Labor Beat on the Chicago IMC or the items with WAS 'union' on the global IMC). Chicago includes labor stories and features. NewsCenter. News today. Including popular columnists. And wire service and web searches. Dogpile. Search the Internet using many of the major search engines at once. Labor Beat's bulletins about 'labor and the media'. Error. 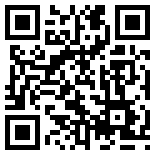 Updated URL address needed: U. of California, Berkeley library research resources. Chicago Jobs With Justice, including an action calendar. Class War Channel. Selected shows on working class issues. [ Play Now]. Live studio shows on some preannounced Wednesdays! Other cities. Days and times vary. Help add MORE TOWNS AND CHANNELS by volunteering to contact local tv channels and cable systems! Every TV broadcast company is vulnerable to a petition to revoke its license because it fails to serve the public interest. And every cable company is vulnerable to losing its franchise to use the public rights-of-way because it fails to allow citizens to schedule programs, as upheld for Labor in Rockford, Illinois. Use distribution and promotion materials to reach more listeners. There are sometimes news releases about our new shows. NOTE: Workers organzations' donations help Labor Beat. 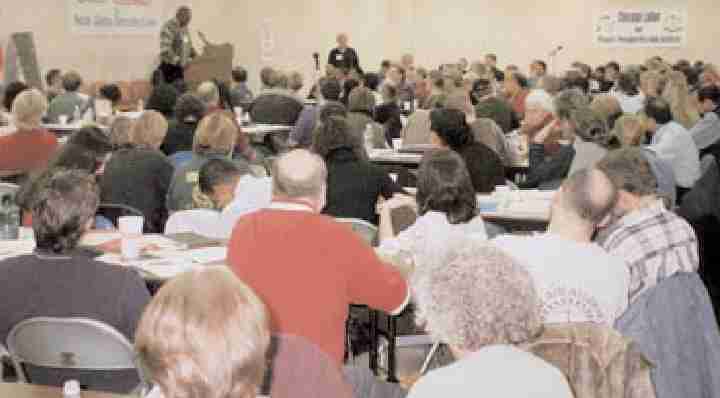 Please request that your local, regional, or national executive committee approve sustaining contributions of 200 dollars, or grants of any amount. We are a bona fide nonprofit IRS 501(c)(3) organization. You can refer them to this web site, or ask us for a letter and appeal packet. Get a .pdf of business-card size ads, 10 per page as easy handouts for promoting Labor Beat and www.LaborBeat.ORG. AFSCME Local# Board donated $1200, 6 month's rent, to Labor Beat. The Tamiment Library (New York City) circulates many Labor Beat shows. www.tamiment.org? SEIU Local 73's Board donated $500 to Labor Beat. Teamsters Local 705 sent $500. IBEW 1220 made a donation and purchased 10 Labor Beat videos to donate to local high schools. NABET-CWA 41 support: Thank you to Local 41 for another generous donation. Thank you to Mr. John Joslin for the generous donation and purchase of many videos. Mike Tremela donated a computer, printer, and desk. COMPUTER need: Labor Beat could use another, even very old, computer. Can you or your organization donate one? "LABOR BEAT is the Chicago-based Committee for Labor Access, We advocate for rank-and-file labor's own media and produce our own labor television and radio shows and newsclips. CLA develops and distributes progressive television, radio, videos, and Internet communications on unions and workers issues. (More than seven hundred Labor Beat television programs and Labor Express radio programs have now been produced.)" Learn more about us. PLEASE HELP WITH OUR CURRENT FUNDRAISING APPEAL! Equipment, rent, and other expense help is needed. A past Labor Beat newsletter described how Labor Beat operates and makes our appeal for support from you and your union. Also, Your letters of commendation may help us find some grant support. 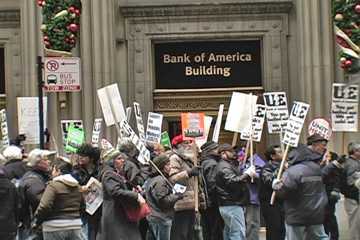 Labor Media in Chicago: Issues and Perspectives, an article by Larry Duncan, 13kb. Newsletter archives of UPPNet, the Union Producers and Programmers Network. Submit your own productions and clips. Set a bookmark favorite now for www.laborbeat.org, the Labor Beat web site. Gary Brooks, Chairperson. Jerry Mead-Lucero , Labor Express Radio and Vice Chairperson, LE Facebook editor, blogging as The Pilsen Prole. Larry Duncan, Treasurer. LaborBeat.Org site editors. Labor Beat is affiliated with International Brotherhood of Electrical Workers Local 1220, but views expressed in our productions are not necessarily those of Local 1220. Board Meetings monthly, various Saturdays. Site editors. LB Facebook editor. Workplace takeover wins all demands. a U.S. soldier in Iraq. www.laborbeat.org. 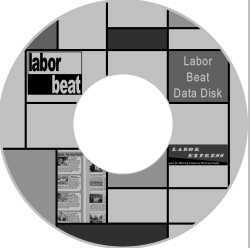 FIND "LABOR BEAT" anytime via Google, Yahoo, etc. And add Labor Beat to your bookmark favorites. LINK TO Labor Beat from your own web pages. Search services should associate Labor Beat with keywords: labor beat, laborbeat, labor, workers, unions, media, television, radio, cable, video, broadcast. MENTION LaborBeat.ORG in your publications and productions, www.laborbeat.org.